Canterbury was a bustling little tourist town for sure but early in the morning and after four or five in the evening, the streets were relatively empty. As a matter of fact, we found that most everything except the larger restaurants closed by six o'clock. 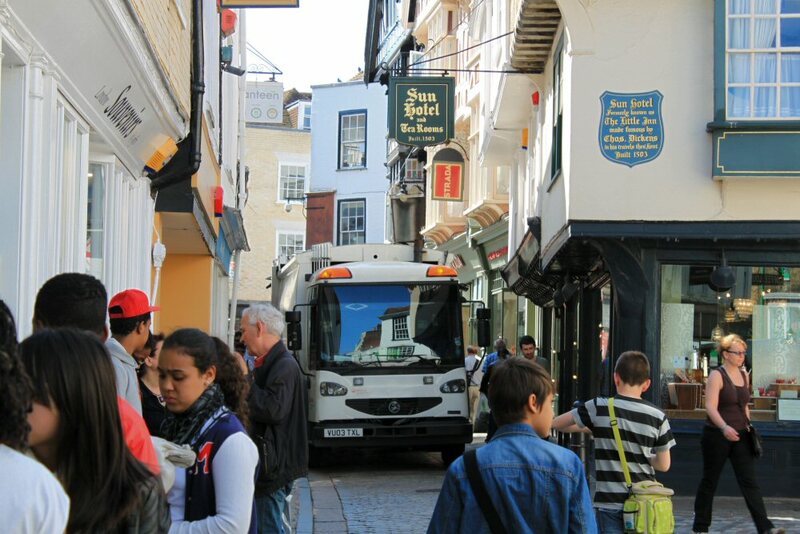 During the day, most of Canterbury is pedestrian but until ten in the morning, cars and trucks are allowed through the narrow streets to do their deliveries. As you can see in the picture, there's a good reason for making the streets pedestrian when the tourists begin to arrive by the busloads. 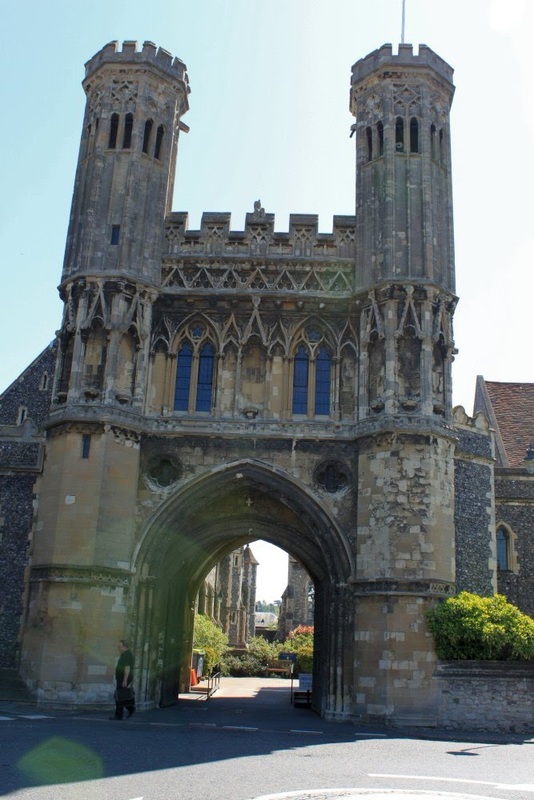 After finishing the first route of our Canterbury Audio Tour, we ate a light lunch and found our way back to the starting point at Christ Church Gate in front of the Cathedral grounds. We walked down Burgate to Lower Bridge St. and crossed over. Lower Bridge is outside the historical part of the city and is heavily trafficked. Just down Lower Bridge was Lady Wootton's Green, a small well manicured garden with two statues prominently standing in the middle of it all. 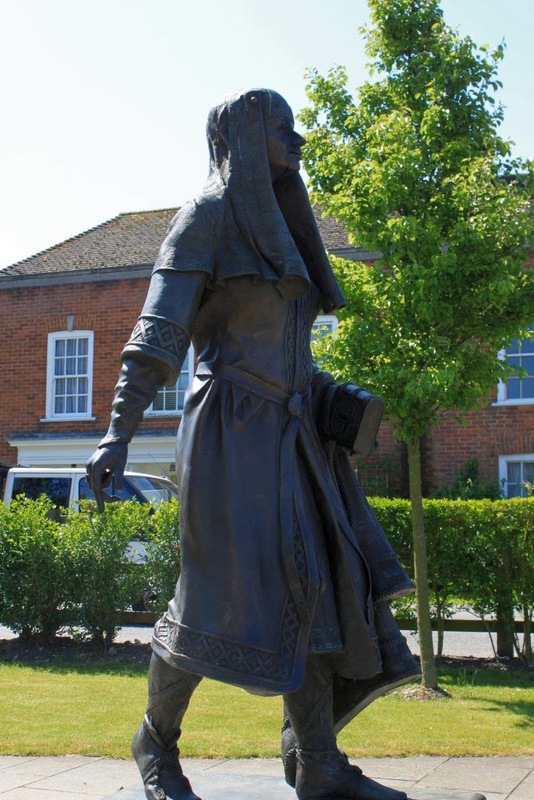 The statues are relatively new (2006) and are of Saxon Queen Bertha and her husband King Ethelbert who were instrumental in returning Christianity to Kent. It is said that Queen Bertha walked through this area each Sunday to attend church services. So who was Lady Wootton you ask? 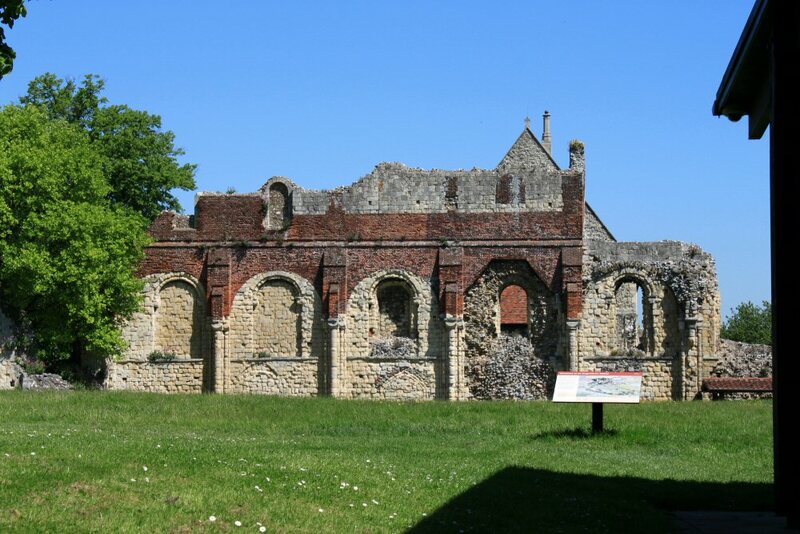 Apparently later, when King Henry VIII decided to dissolve the monasteries in England because the Pope would not allow him to divorce his wife, part of St. Augustine's Monastery became lodging for the king. Later it was leased to Edward Lord Wootton whose widow, Lady Wootton continued to live there until she died. When the garden was designed and planted, it was named for her. At the other end of the Green is the Fyndon Gate, rebuilt in the 14th century and is the entrance to what is now a part of King's School. Further down the street and around the corner we found the entrance to the old ruins of the original St Augustine's Abbey. We opted not to go in. It was getting very warm and we didn't think we wanted to take the time. Crossing back over Lower Bridge St. we found the entrance to the City Wall and climbed up the walkway. The wall dates back to Roman times and was already well known in the third century. Towers along the wall were for archers. There were three to four foot upside down keyholes spaced around each tower for the archers to shoot through. Several large gates have been restored (see Westgate in previous post). We walked along in the unusually warm weather and wished we'd packed the sunscreen. Who knew? At the Dane John Mound, we paused for a few moments to try to figure out its significance. It was basically a large mound of earth with a monument on top. Originally it had been large enough for a castle to be built on top of it. 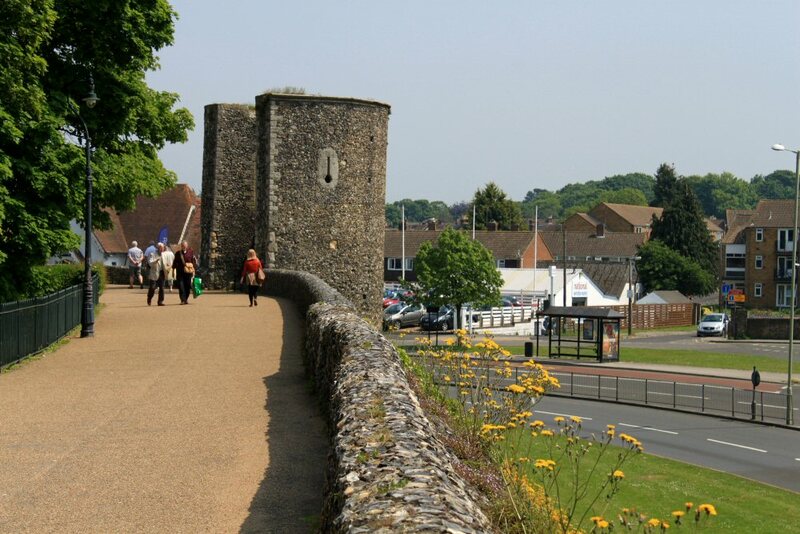 One of the reasons for building the city wall was to protect it. 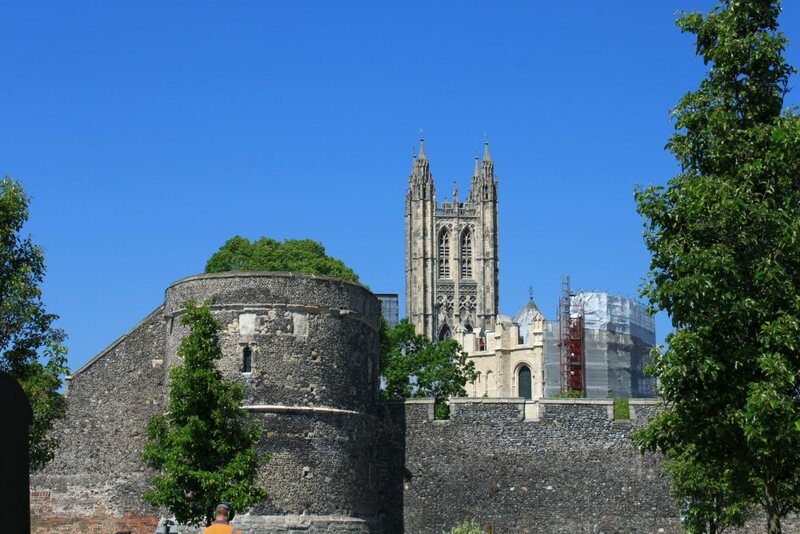 We exited the wall and walked through the shady alleyways to the Canterbury Castle once again. I had hoped to find a bench in the shade but there were none. Normally people don't seek the cool shade in England. Since we'd visited the castle the previous day, we didn't go back in but continued on to our next point of interest, the Greyfriars. On our way to Greyfriars, we passed the Museum of Canterbury, a beautiful brown stone building with a pretty garden court where some were enjoying an afternoon tea. 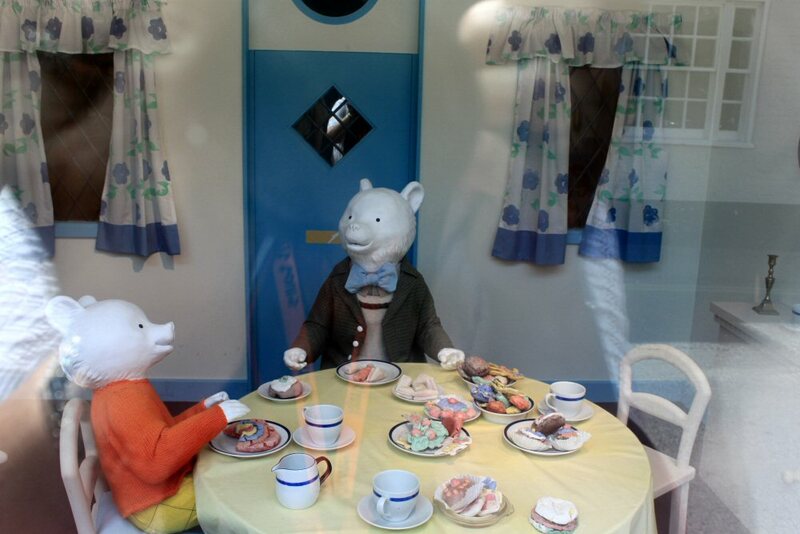 It is also home to the Rupert Bear museum. The Rupert Bear is a popular children's character in England and the original author/cartoonist, Mary Tourtel, who was actually born Mary Caldwell in Canterbury in 1874. The Greyfriars was truly off the beaten track but the flowers that lined the river along the way were beautiful. The area once belonged to a large 13th century Franciscan friary (a brotherhood of friars). 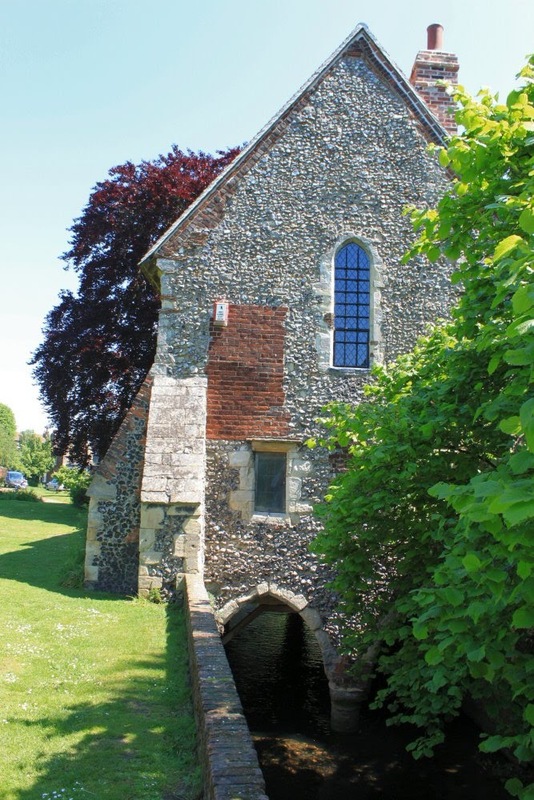 All that remains of it now is a small chapel that spans an arm of the River Stour. It was a lovely peaceful place and would have been a nice place to stop and rest but we continued on, afraid that we would tire before the end of our tour. 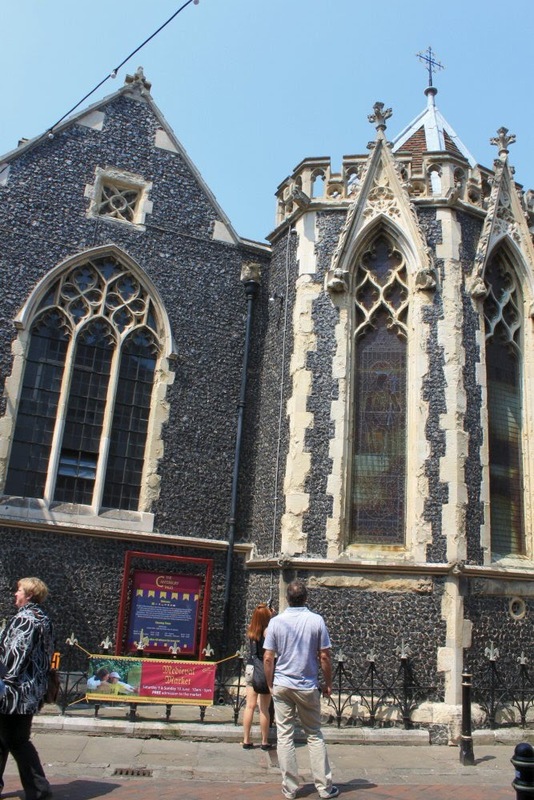 Getting back into the heart of the historical district, we passed by the Canterbury Tales which is housed in St. Margaret's Church. The tour inside the church takes you through several vignettes of medieval life. It appeared to be very popular with groups of students who lined up outside waiting their entry. Once again we arrived back at the entrance to the Canterbury Cathedral. We removed our tour paraphernalia and began our trek back to the Riverwalk to return it and then continue on to our B&B to rest and relax before dinner. Ah, but when the "Cream Tea" sign caught our eye, we knew we had to stop. You can't miss cream tea in England. Love your posts. Interesting & colorful. Always readable. Thanks!